All of our Introduction Courses are for people who are new to sea kayaking. It might be the first time you have ever sat in a kayak, or maybe you have done it once or twice in the distant past. Ideally you will be keen to learn and will have a basic level of fitness. Maybe you have already decided that this is the sport for you and you are wanting to springboard your way into your kayaking career, looking to buy all the equipment as soon as possible. Or maybe you are just keen to see what sea kayaking is all about. 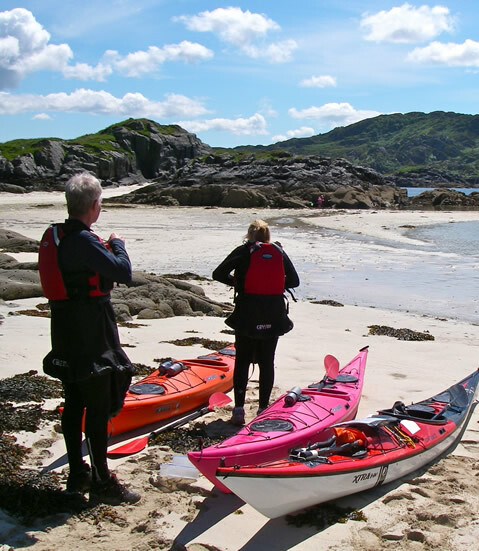 These courses will give you a comprehensive insight into every aspect of sea kayaking. During the space of a couple of days we will teach you all the basics of sea kayaking. These courses include boat handling skills, navigation whilst on the water, trip planning (including some basic tidal knowledge) and essential rescue techniques. Whilst on the course you will have the opportunity to try out a selection of different boats and paddles. You can be sure the equipment you are using is top of the range, and all specialist equipment is provided. Based from Glenuig Inn, we will head out each day to a different location so you are also able to explore the local area and go for some amazing journeys whilst learning from a top level coach. Days start at 9:30 am and we return to base at the end of the day where there are hot showers, a drying room and great food and drinks on offer! Get in touch now to book! During the 5 days you have the time to practice all of your newly learnt skills with instruction from a top level coach. You will also have the time to try out the full top-of-the-range composite sea-kayak fleet to better understand the differences in boat design and performance. And you will be able to explore even more of the amazing locations around our base in the Sound of Arisaig! When booking this course you have the option of doing all 5 days as day trips. This allows you the luxury and comfort of staying at Glenuig Inn, whilst still exploring the local area, where the possibilities for stunning day trips are endless. You will be involved in the planning of each trip as we go through the week. Days start at 9:30 am and we will return to base at the end of each day for hot showers, a warm drying room and good food and drink at the Inn! For more details on programmed Introduction Courses, check our dates page. We are always very flexible so if there is nothing which suits you planned already then let us know and we can plan a course around you.